If your rod gets damaged because of an accident, you can make an improvised fishing rod if you have a knife. Your work becomes even easier if you manage to hold on to a tackle box with the necessary hooks and a spool of monofilament. Should you ever find yourself stuck in the woods with just a knife, the guide below can help you produce an improvised fishing rod with materials from your surroundings. Start by searching for a six- to seven-foot-long branch that’s no thicker than your thumb. Once you’ve found a branch, carefully break it off from the tree. Break the branch to the desired length and if it’s dry enough, snap it in half against your knee or any hard surface. If the branch isn’t dry, but it’s still a bit flexible, cut it with the knife. Don’t use dead branches because they will break easily. Test the tip by bending it to the point of snapping. The more the branch snaps, the stronger the remaining pole gets. Once the pole is trimmed to the desired length, use your knife to remove any remaining branches, leaves, or shoots. Make the pole as smooth as possible to improve its weight. A smooth pole is also easier to handle. Your job is easier if you have some monofilament fishing line. If you don’t have any, you can make do with some sewing thread. If you don’t have any thread, look for thin green vines in ground cover or in the undergrowth near different bushes. The greener the vine is, the stronger it’ll be. If you find a vine that’s 10 feet long, remove any tendrils by pulling carefully, so the line doesn’t get damaged. Ideally, you should have some professional fishing hooks with you. If you lose most of your gear, turn other items like paper clips or safety pins into fishing hooks. You can also use soda can tabs, but don’t throw the rest of the can away just yet. Use a soda can to make a fishing lure. Turn the shiny metal into flasher or spinner fishing lure shapes. Cut the can with the small scissors on a Swiss Army knife/multi-tool or with a regular knife blade. With some practice, you can also carve V-shaped hooks out of wood. Green wood works best when making V-shaped hooks. Carve a groove on one end, which will be the hook-eye area. You’ll tie your fishing line onto this groove. If you need bait, look for insects. Your options include earthworms, which you can find underground, under rocks, around moss, or in other moist areas. Once you’ve baited the hook, you can start fishing. When fishing in a post-SHTF world, consider your fishing areas carefully. Maximize the energy and time you spend on fishing and don’t waste your resources. If you fish in stagnant waters, look for still pools. The still water in these pools will make the bait as visible as possible, and this will significantly increase your chances of catching fish. 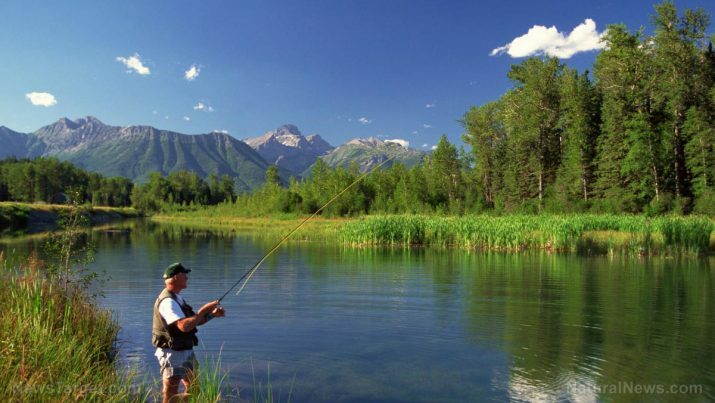 In running waters, aim for areas behind exposed boulders since fish may gather in these areas. When bank fishing, stand on the water’s edge and wait for the fish to bite. It can be challenging to make your own fishing rod, but it’s not impossible. Your work will be even easier if you have some fishing line and hooks. In a survival situation, you can make an improvised fishing rod with some skill and practice. You can read more articles with tips on how to gather food when SHTF at FoodSupply.news.